plusdealpark has no other items for sale. Good buy for the buck. Lenses are clear and rose coated for sun light. Easily adjusts focus for near-far objects and the 16 power is just right, not too little nor too much. Better all around than my 8 power high dollar binoculars. I have already used it in field spotting deer movements this spring, in preperation for winter's hunting season, and it works fine. If you want a really good scope than this one isnt for you. Its not absolutely horrible, but it aint good either. As soon as i got it and took it out of the box and looked through it, the lenses were all fogged up. Its just cheap China made b.s. What do you expect for 12 dollars. 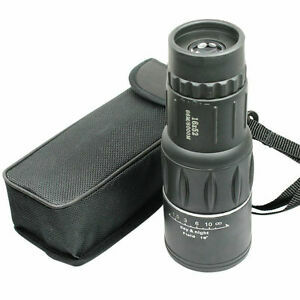 Good focus, large eye piece for easy viewing and easy on the eye even at maximum magnification. A good value.